With the completion of construction on our new Dickinson Middle School in the Fall of 2017, Hagen Jr. High will be ending it's life cycle of housing 7th and 8th grade students for almost 50 years. Lots of students, staff and employees have been a part of Hagen for many years and even before that time as Central High School. Elaborate scrapbooks were created from the years 1968 to 1994 chronicling the fun times, the rewarding times and the life experiences of thousands of students, several hundred staff and administration members of Dickinson, North Dakota. These scrapbooks are housed in our library and will be on file at our new school but browsing them is a difficult task as they are delicate objects that can't be handled very much without destroying them. In an effort to have these memories available to anyone, we are photocopying the pages of these scrapbooks. 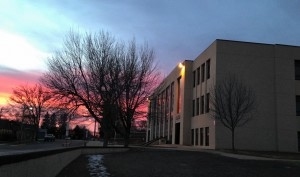 Though they are not photographs of high quality, viewers should be able to view them and recognize the memories of their years at Hagen Jr. High. Virtual Fly Thru of Dickinson Middle School Click on the picture above to launch a virtual tour of our new middle school.